I loved the first disc of this series! The storyline involves a top secret project involving the latest in combat cyborg technology in the form of a deadly but beautiful girl named Kurumi. Made by a brilliant man using both his wits and technology that cannot be explained, Kurumi lies in wait to be activated by her master. Unfortunately, things don't go as planned and when Kurumi is activated by young boy who out of curiosity kisses the cyborg when he stumbles upon her when playing with his friends. Kurumi immediately attaches herself to him and will only obey the commands of this lucky child much to the despair of her rightful creator. 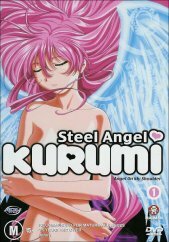 Kurumi really belongs to a select group called the Steel Angels who are being activated by a mysterious group who are hell-bent on destroying her and set her 'sisters' to carry out this task. Why? Good question and one that I am not going to answer in this review. Combine intriguing character development along with some brilliant sequences, including one that really stuck in my mind of Kurumi effortlessly catching the fist of a huge battle mecha! There are 6 episodes on this DVD and they each are very short, only going for about 15 minutes per episode. I think it was the pacing of each episode and the way that they carried into each other that it made for such compelling viewing. The animation for this disc is spot on and I really enjoyed the way that every single bit of it was portrayed. You are guaranteed a laugh every episode and the pace it runs at is almost manic. The disc is full frame and looks great, all the pictures are clean and crisp the whole way through. Audio is in Dolby 2.0 and fully takes advantage of this setup. The true beauty of this disc though is in the extras, the sheer amount of information you get about the title is awesome. The length of some of the extras is about 20 minutes or so and provides detailed information, especially from the voice actors on this brilliant title. I loved this disc and every part of it. I hope that we are lucky enough to cover the rest of the series.